When it comes to Kyoto and sweets, there are many traditional Japanese sweets shops here with hundreds of years of experience behind them (such as Awamochi-dokoro Sawaya, which has been selling its simple red bean and millet mochi for over 300 years). But this is how things used to be here. Although these traditional sweets are popular even to this day, there is a new kind of sweet delicacy that has gotten to be more and more popular. So these days, traditional sweets are often enjoyed with a hearty portion of ice cream on the side as a parfait or a sundae. And to get back to our topic of Japanese tea, the ice cream in these parfaits is often flavored with tea, usually either matcha or hojicha. Some parfaits also flavor the jelly, cakes, and other sweets in them with matcha or hojicha, making the whole parfait taste of tea. There are many cafes and shops in central Kyoto offering parfaits, many of them in convenient locations like Nishiki Market or Gion. Nishiki Ichiha offers parfaits both with matcha and hojicha, and they’re especially great for those who like jelly, as you get quite a lot of jelly with them. If you like ice cream, you might have to look elsewhere, but the parfaits here have a refreshing aftertaste, although you do get to eat quite a lot of jelly. The best thing about this café has to be that it’s located in the Nishiki Market. Gion-Komori does not offer hojicha parfaits, but their matcha parfaits are even better, so there shouldn’t be anything to complain here. The specialty of Gion-Komori is how much stuff there just is in their parfait: there is matcha cake, different kinds of mochi… the taste of their matcha ice cream also deserves a special mention, as it has a nice, rich taste of matcha without too much bitterness. 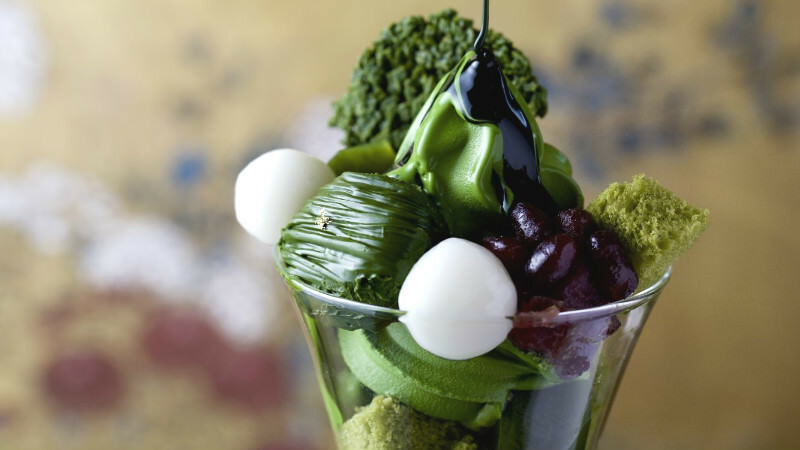 The best place for a parfait in Kyoto has to be Uji, the home ground of green tea and especially matcha in Kyoto. Gochio Café is one of the best places in Uji to enjoy matcha. Gochio café specializes in matcha that is single origin, meaning that they can even tell you who the farmer who grew the matcha is. The matcha parfait here is on the smaller side, but it’s full of deliciousness. Because of its smaller size, there is no “filler” in it, and it’s delicious from start to finish. Also of note are their single origin matcha espressos; be sure to try one! Tsujirihei Uji Honten is the place in Kyoto to visit if you want to have a great matcha or hojicha parfait. 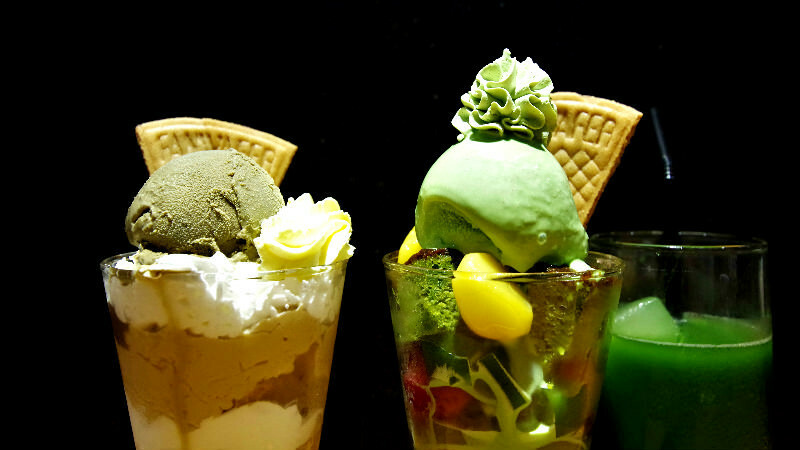 Their matcha parfaits have an unparalleled, strong taste of matcha while the hojicha parfaits have a nice smoky taste. The parfaits here come with a heftier price tag to them, but the taste is well worth it. Tsujirihei Uji Honten is an especially nice place for tea aficionados who want to have tea with their tea-flavored sweets. You can have a cup of gyokuro here to truly enjoy your matcha parfait with the maximum amount of umami. Or you could go with sencha, kabusecha, genmaicha, hojicha… suffice to say, there’s a lot to choose from. The culture of Kyoto is deeply steeped in all kinds of green teas, and there is no better place in Japan when you want to get to know Japanese teas better. The slight sweetness and umami you can find in many Japanese teas is something that makes them taste elegant yet somewhat addicting. So get out your teapot and find some new tea leaves to brew in Kyoto!